Official teaser for Sony ‘Honami’ leaked? A new picture deemed to be an official teaser image of the upcoming Sony ‘Honami’ flagship has leaked. What is immediately apparent to us is that if this picture is real, it looks a little different to the Honami images recently leaked. The edges are more rounded, much like the Xperia Z Ultra, compared to the straight edges of the leaked images which looks very similar to the Xperia Z. Although, this may just be down to the angle of the picture. Either way, take the picture with a grain of salt. The picture shows a teasing glimpse of the right side of the phone where you can see the power button, flap and volume rocker. This purple-coloured Honami seems to show that the frame will be of a different material – perhaps aluminium much like the Xperia Z Ultra? However, in other purple Sony Xperia phones, the frame is normally coloured too, whereas this is not the case here. So this could be a departure of recent trends or maybe this image is not final (or even not real). 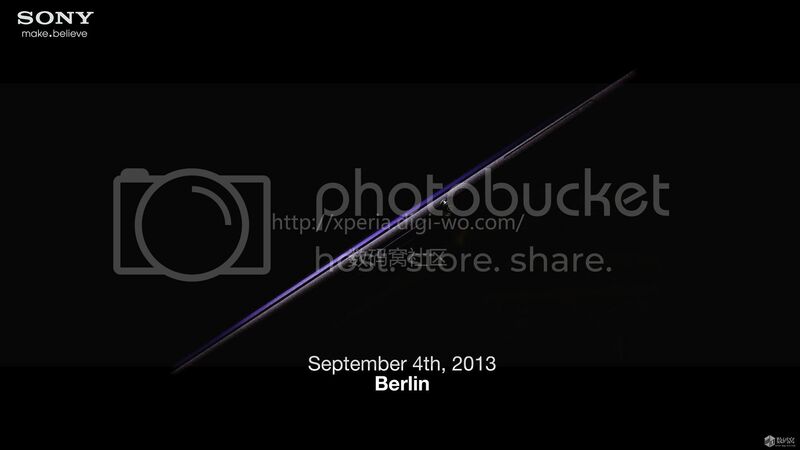 The image then has “September 4 2013 – Berlin” in reference to its likely reveal at IFA in early September. Just under a month to wait for official details. Here you can see Sony’s signature power button, as used in all of the 2013 Sony Xperia range. This pic is important as the direction of the power button gives us the orientation of the handset i.e. the display is on top. Above the power button sits a flap. Here you can make out the edge of the display, just above the purple strip. The faint white strip you see here could even be the shatter-proof screen protector that Sony places on most of its smartphones. Thanks Ashish and ki-hyun kim! Previous post: Xperia Z Ultra firmware certified (14.1.B.1.493), will it bring X-Reality for mobile?